When you’re working with your team in Slack, discussions can move quickly and cover a lot of ground. They evolve — and branch off — as people share insights, ask questions, and introduce new topics (or resurface old ones), which may not involve everyone in a channel. 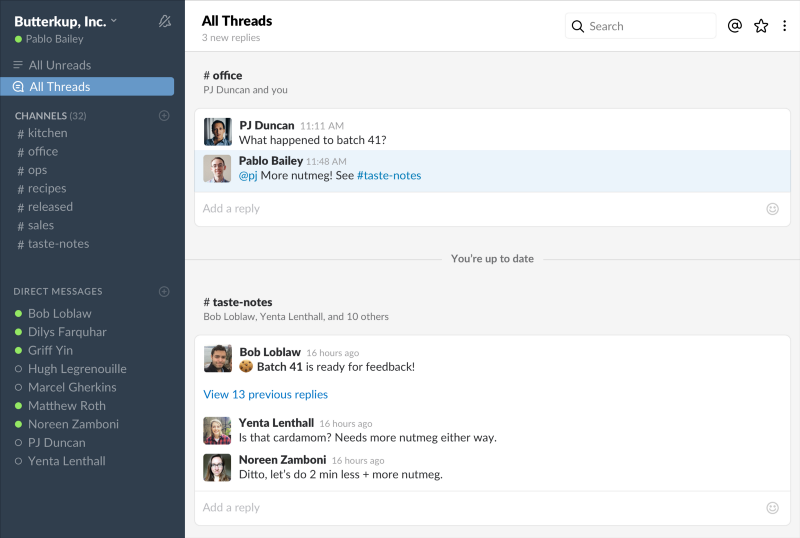 Now with Threads, a new way to connect related messages, it’s easier to follow and manage the variety of conversations happening in Slack. Messages with threaded replies will show thumbnails of discussion participants right in the channel, as well as the number of replies posted. Click through to view the threaded conversation in the right sidebar. You can chime in, add reactions, or simply select to follow along from there. Unlike a regular message posted in channel, replies to a thread won’t automatically mark the channel as unread or notify you, unless you’re directly mentioned. (The All Threads view in your sidebar will be highlighted, however, so you know there are new messages in one of your threads — see more on this below.) This way, you and a subset of your team can riff on ideas, triage problems, or clarify feedback in a focused space. Although they’re tucked away, threaded conversations are archived and searchable so anyone can access the information and context they need without joining every discussion. Need to make sure a specific person sees your reply? Simply @-mention them as you normally would and they’ll be notified about the thread. When decisions are made or a message in a thread is worth sharing back with the wider channel, you can post your reply alongside the original message in the channel. This will highlight the channel in the left sidebar and let members know that there’s a new message. Anyone can click on the update to open the thread and read through the discussion if they like. Since threads can happen in any channel, you might find yourself participating in more than one at a time. To help you keep track, all of your threads live in the new All Threads view, where you can read and reply to these conversations. Whenever someone replies to a message you wrote or responds to a thread you’re in, this view (located at the top of your channel list) will light up and appear bold. When a press article or public announcement is posted in the #pr channel, any discussion takes place in a thread under that post. When bugs are reported in our various #triage channels, team members use a threaded discussion to dig into the problem, and then report the fix back into the channel. When an upcoming product launch is shared with the sales team in the #sales-announcements channel, people use a thread to ask and answer related questions and link to resources. For more on how we designed Threads, head over to our Engineering blog. To learn how to develop your app with the Threads API, visit our Platform blog. Threads are rolling out over the next few days and will be available on the latest versions of our desktop and mobile apps. Give them a try and send us a note or Tweet to let us know what you think. Learn more about Threads in our Help Center.